This image shows the famous circumstellar disc of debris and dust orbiting the star Beta Pictoris 63.4 light years away. This is a very young system thought to be only around 12 million years old and is essentially similar to how our own Solar System must have formed some 4.5 billion years ago. The disc is seen edge-on from our perspective and appears in professional images as thin wedges or lines protruding radially from the central star in opposite directions. 2.5120.56 = 1.67, so it appears Alpha is 1.67 times brighter than Beta. This means that exposure for Alpha should be 1/1.67 = 0.597 times that of Beta. 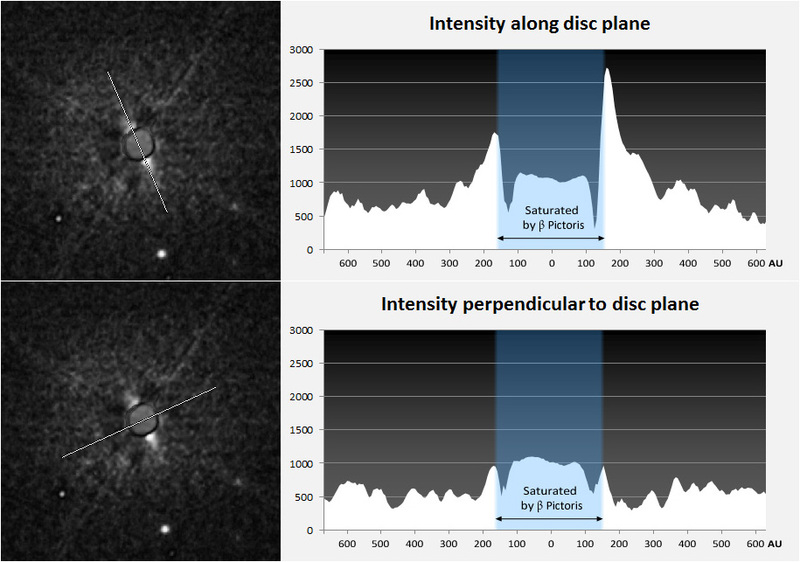 With this approach I managed to capture the first amateur image of the debris disc on 16th November 2011. This image generated a lot of attention from both professional and amateur astronomers and was reported in the media all over the world. After the initial success of capturing the disc I was contacted by several people in the astronomy community, among which were Dr Grant Christie of Auckland's Stardome Observatory. Following his suggestions I had a go at imaging it again using shorter exposures. This was to minimise the area saturated by Beta Pictoris itself and potentially reveal more of the debris disc closer to the star. The ICX098BQ chip in the ToUCam saturates fairly quickly for bright stars, even at very short exposures. Since long exposures with my ToUCam can only be controlled in 0.5s increments I decided to use 7.0s and 4.0s for Beta and Alpha respectively, which translates to a factor of 0.571. This was very close to the calculated brightness factor of 0.597 and still significantly shorter than the 30.0s I used for the first image on 16/11/2011. 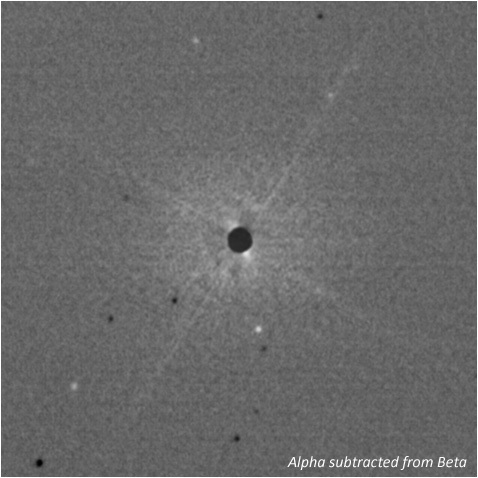 So for this second image I collected 344 images of Beta Pictoris at 7.0 seconds each and 299 images of Alpha Pictoris at 4.0s each. Both sets of images were dark subtracted and stacked separately in Registax. I then subtracted the Alpha image from the Beta image in PixInsight LE, and also created the absolute difference between the two. 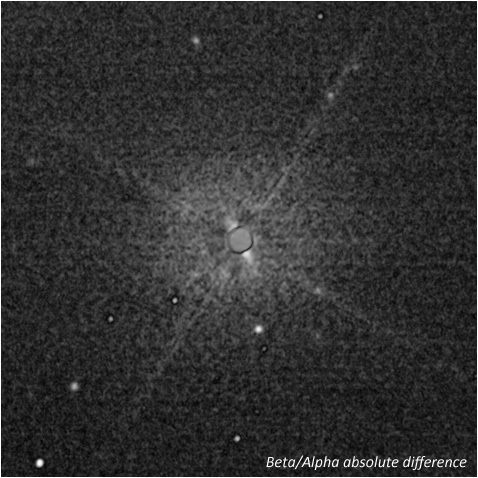 In the subtraction image on the left contributions from Alpha Pictoris are dark, while contributions from Beta Pictoris are light. It is clear that there is a fairly strong signal corresponding to the exact location of the debris disc and that it is coming from the Beta image. I created a more natural looking final image by taking the original stacked Beta image and then blending in the central parts from a stretched version of the absolute difference image that showed the dust disc. I decided to also keep the black spot of the central glare from the difference image since the contrast with the protruding disc just seems better this way. So there is no occulting disc involved, it is simply for the sake of presentation. I created a couple of versions which can be seen in the gallery below. This is a vastly better image than the first one taken on 16/11/2011. I believe the higher number of subframes (344 versus 55) coupled with the shorter exposure times are responsible for the improvement. It seems from the figure above that if a limiting magnitude of approximately 20.0 is assumed, then the debris disc should be visible out to somewhere around 250-300AU. This corresponds with what is seen in the profile plots above. The disc is most prominent in IR and fortunately the ICX098BQ CCD chip is very good at picking up signals in IR, probably on par with or even better than some modern CCD's in this aspect. Another property of the ICX098BQ that helps here is actually the Bayer colour matrix. This is because each pixel either receives only red, green or blue light due to the overlaid Bayer matrix. But since the matrix dyes are practically transparent to IR light, every pixel therefore receives signal from the IR band. So the IR S/N ratio in the final image can be assumed to be correspondingly higher than the RGB S/N. This could easily explain why the ToUCam seems to pick up IR light so well; the Bayer matrix effectively acts like a IR pass filter and allows a proportionally higher number of pixels to be IR illuminated than RGB illuminated. While I have not tested this in practice it could mean that the limiting magnitude of the ToUCam is higher in IR than in RGB. This is encouraging work - what an effort. For a self-proclaimed first amateur (are you sure?? this is really good) pic of another solar system, this is really stunning. You are rightfully special to have accomplished this. Heck, I feel special at having witnessed it here. Well done.That is very impressive. I love your presentation, too. The 3-d plot with the axes in au's is really cool. As a "professional" (what a weird word to use) having worked on this object for the past 10 years, I can only sit back and applaude: this is really amazing. congratulations! An inspiration to professional astronomers too! Congratulations on another great observation. This is truly one of the finest observations I've seen in a long time. A huge inspiration to all amateur astronomers. Congratulations. While I am not an amateur astronomer, I appreciate all of you watching the skies for us. I love looking at the images. Truly specatacular. Keep up the good work. This is even better than seeing Russia from my house! Very well done Rolf !! Truly amazing with a 10"
I am posting the photo with it's frame on my blog thecleverevolutionproject.blogspot.com with some information about you/the photo and links to this page and also some information about Alain Lecavelier des Etangs "call" to aamateurs.. If it is not ok to post the photo please email me cleverevolution.project@gmal.com. Hey Rolf, I'd like permission to use your photo in a gallery I'm doing for Yahoo! News about amateur astronomy. If you could get back to me ASAP that would be fantastic. Thanks so much! great work!!!! I am impressed that amateur astronomer can today reach the imaging capability that we had in the 1990s. One small correction though. You did not image another "solar system" but another "planetary system" or "stellar system". There is only one Sun and that's the one we see nearby Earth. Fantastisk! Et stort tillykke fra Danmark. Extraordinary work. Congratulations from a mere enthusiast to a very impressive amateur astronomer. Keep up the good work and I wouldn't be surprised to see your title shift from amatuer to professional astronomer! You are an inspiration to fellow amateur, great work! Congratulations, I'm amazed by people like you. By the way, is there an observatory in NZ that you would recommend to visit? Congratulations Rolf. Outstanding achievement. Must be quite a thrill! Great Work Rolf. This is unbelievable. Being an amateur and finding/imaging a solar system is way too cool. Be proud of that. You really set a mark!!! Thanks for that great picture. Greetings from germany. First: CONGRATULATION for this great image of the Beta Pictoris dust disk !! This image remembers me when (with Guy Perrin, Alfred Vidal-Madjar, François Colas and others) we obtained very similar images in 1992. It was a great time. 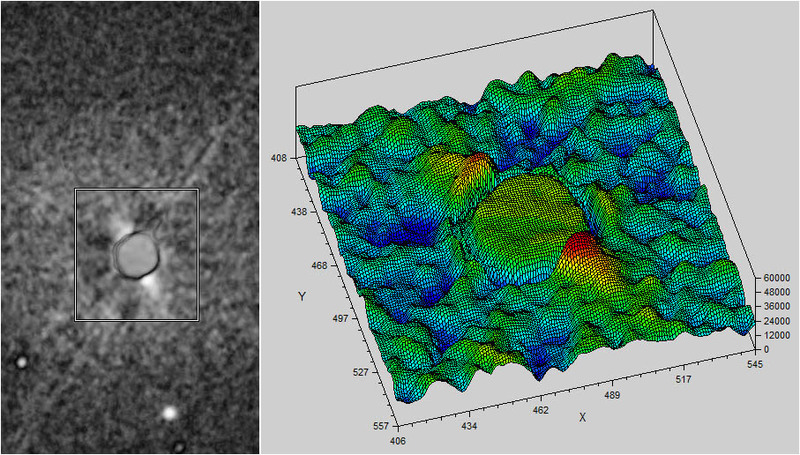 I have no doubt that this is really the disk of Beta Pic that you have in your image: its looks so similar to what we obtained. Captured with a 10" telescope, your image represents a very nice achievement and a technical exploit. CONGRATULATION!! As I wrote to a journalist asking me, I feel that it is unlikely that your image can be used to learn something new about this Beta Pictoris system. But this is not the most important: the most important is that your image is impressive and beautiful. A beautiful image of a young planetary system 62 light-years away, a beautiful image among other beautiful images in your pbase galleries. Nonetheless, your work shows that amateur can obtain results which are potentially useful for scientists. 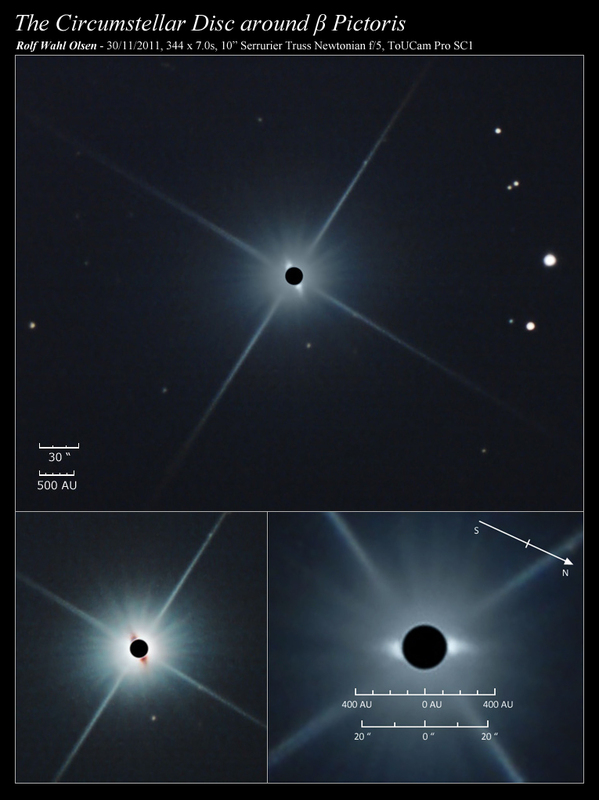 In particular, I think about transit of exoplanets some of which can be surveyed by amateur astronomers. By the way, this gives me the opportunity to send a call for photometric survey of Beta Pictoris, which can be done by (expert) amateurs. Indeed, in 1994 we discovered that a planet likely transited in front of Beta Pictoris in 1981. In 1994, the claim for the observation of a transiting exoplanet was regarded as very suspicious. But the things have changed, and since 2008 we know that a planet orbits around Beta Pictoris (Lagrange et al. 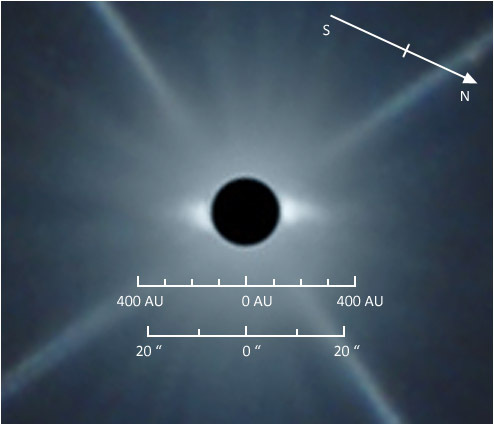 2008), moreover the imaged planet is very consistent with a transit in 1981 (Lecavelier & Vidal-Madjar 2009). To predict when the next transit will happen a survey of Beta Pictoris photometry is needed. In that regard, the help from amateur can be useful. A comment: in contrary to the title of the photo, the Beta Pictoris disk is not "protoplanetary", this is a "debris disk". The dust seen in the image is not massive enough for a new planet to form. This dust is produced by collision between asteroids and/or evaporation of comets: the dusty grains captured in your photo are the debris of minor bodies orbiting in a young and active planetary system, similar to our own solar system when it was a few million years old. I take my hat off to you sir! Fantastic picture and great achievement! Great work. How does it feel to be immortal on the Internet? I saw you on Channel 3 from up here in Slidell, Louisiana, USA after watching the news. Tell everyone that NZ is a terrible place, so more lights don't go up. Congratulations Mr Olsen! Today the amateur astronomers make importante jobs at astrophotography...! dear mr. olsen, i would like to ask for your kind permission to show your images in a report about your achievement in my blog (grenzwissenschaft-aktuell.de). please could you get in contact with my - as i was unable to find out a contact-adress to you. Great job! keep the good work going! 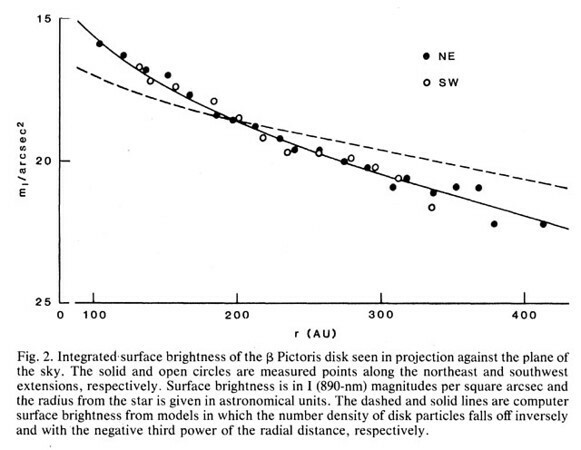 Read about your achievement in detecting and photographing the far away solar system. Felicidades desde España, es un gran trabajo. Congratulations from Spain. It is a great job. I´m very happy for you.. thanks,,, and,, continue!!.. Felicidades, compañero,, !!!-.. Congratulations and follow on with it! Congratulations mate. What a great achievment... you know you've done well when Phil Plait congratulates you... Keep up the good work! Congrats for this wonderful pic! It's amazing. Fantastic work on that Beta Pictoris project! Your astroimages are top rate and all that from a Toucam! Like many, I have come to your site after seeing an article on your photo of beta pictoris. Congratulations on that, and on your wonderful site, which showcases so many wonderful photographs. ..that is eff-ing awesome work. Please consider contacting the '93 authors, and see if they'll co-author a p-reviewed paper with you! Extraordinary. An outstanding achievement, well done! Thanks and congratulations on your achievement. Fantastic work, congratulations! You're an inspiration to amateur astrophotographers everywhere. All this done without adaptive optics! I'm fllored. Wow! Spectacular! Now only if we can contact some intelligent life there! Our planet desperately needs it! What if you applied the same image processing techniques to images from Hubble? Could you not refine the already amazing picture you have here? And I assume the image above is the highest resolution you have? Saving the image to my PC and zooming in on it just fills my imagination with the details that aren't there. really nice... you'll remain in History for doing this! Try to nail more photos like this! I would say you are an unpaid astronomer, not an amateur astronomer. Absolutely stunning work. A very impressive endeavour - well done. Heck yeah! A fantastic accomplishment! Congrats! Think outside the box, and you'll get this kind of outcome. Well done mate. Outstanding work Rolf!!!! Glad to see work like this from the ranks of us amateurs. Well that's pretty special Rolf! great project, congratulations!